"Woohoo! You have reached your destination! Hold your head up high, because you are a genius!" That's what you'll hear from your car's GPS unit if you download the latest "voice skin" from Netherlands-based TomTom, featuring everyone's favorite nuclear engineer. The GPS maker has been selling the voice packs for some time now, for $12.95, which is not much d'oh. (Sorry, had to.) There are lots of voices to choose from, some for free, but no other version is quite as good at helping you find Moe's Tavern than Homer. And there's a whole range of Simpsons voices available. Don't have a cow -- you'll still need to buy a TomTom GPS to hear them. The cheapest units start at $119.95, and range as high as $369.95. Generally speaking, all GPS units are the same -- they use the same satellites and generally use the same navigation chips. That means GPS makers have been in a race to the bottom: The technology gets cheaper and cheaper, forcing manufacturers to find other ways to choose their brand over some no-name maker. 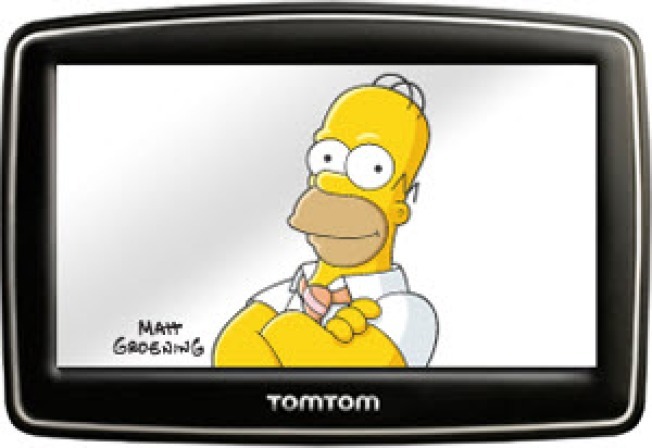 The customized voices are high-margin add-ons which also serve as a selling point for the likes of TomTom.